www.aidsalliance.org - "The Link Up project in Burundi was coordinated by Alliance Linking Organisation Alliance Burundaise Contre le SIDA (ABS). Working with and for young people from key populations was innovative in the context of the HIV response in Burundi. Few actors have worked with these groups because of social taboos and stigma. 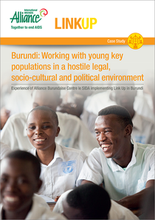 By adopting a range of strategies to reach and meaningfully involve young people who are typically marginalised and excluded in the project, Link Up was able to exceed many of its targets in Burundi, and advance a sexual and reproductive health and rights agenda for young people from key populations."